Lenovo ThinkPad T420. HDD 320 GB. CPU: i5-2520M @ 2.50GHz. Windows Updates. Microsoft Security Updates. Device Manager. Functioning Webcam. Functioning SD Card Reader. Lenovo ThinkPad T420 14" Laptop, i7 2620M, 8GB, 500GB, Win 10 Pro Includes laptop and power adapter only. No other accessories are included. Normal wear. Core i7-2620M / 8GB RAM / 500GB HDD / Win 10 Pro / DVDRW / 1600x900. Lenovo ThinkPad T420. HDD 500 GB. RAM 4 GB PC3-10600. Windows Updates. Microsoft Security Updates. Device Manager. Functioning Webcam. Functioning SD Card Reader. ThinkPad T420 14" Laptop Computer Refurbished. Notebook PC. 14" Display. KEYBOARD & MOUSE. Mouse Type. Microsoft Windows 10 Pro. Windows 10 Pro. LAN Data Transfer Rate. 9-cell battery (11.1V, 94Wh, 8.4Ah). Modular DVD burner. Integrated 720p HD webcam. No internal Bluetooth. 500GB 7200RPM. For Sale is Lenovo Thinkpad T420 i5 2450M 2.5GHz 8GB RAM 250GB HDD. (NO Power cords or AC Adapters included). Condition: Lenovo Thinkpad T420 i5 2450M 2.5GHz 8GB RAM 250GB HDD is in used and good working condition. 1GB NVIDIA N12P-NS1 (NVS4200M). The 9 cell battery is in as new condition - only 28 cycles and holds the full design capacity i.e. no wear. You can expects about 9 hours battery life with light workloads or 6 hours on a typical workload. Model: T420. Product Line: ThinkPad. Interfaces: USB 2.0, PoweredUSB 2.0, USB 2.0/eSATA, DisplayPort, VGA, LAN, Headphone/microphone combo jack. AC Adapter Included: YES. Hard Drive: 250 GB. Op of the line Thinkpad 420. Nvidia NVS 4200M Graphics processor. High resolution 1600x900 screen, with 4GB (expandable and 500GB fast Seagate HD). Lots of USB, Bluetooth and video ports. A new user has been created so it is ready to go right out of the box. Windows 10 Pro. • Battery: Yes. Manufacturer Model Thinkpad T420. Manufacturer Lenovo. This program is only open to a handful of vendors around the world and each is hand selected by Microsoft. Along with the specifications listed, your laptop also features a free version of Microsoft Defender (anti-viral software) and Skype. Model: T420. Product Line: ThinkPad. Interfaces: USB 2.0, PoweredUSB 2.0, USB 2.0/eSATA, DisplayPort, VGA, LAN, Headphone/microphone combo jack. AC Adapter Included: YES. Installed with Windows 7 Pro 64-Bit and MS Office Pro Plus 2016. In good overall condition. Model: T420. 128 GB SSD. One month warranty. Good condition, ready to use out of the box! CPU Cores: 4. LCD Size: 14.1" Widescreen. For Sale is Lenovo ThinkPad T420i i3 2310M 2.10GHz 4GB RAM 250GB HDD (NO Power cords or AC Adapters included). Condition: Lenovo ThinkPad T420i i3 2310M 2.10GHz 4GB RAM 250GB HDD is in used and good working condition. This laptop is used. See pictures for condition. They are of the ACTUAL item you will receive. The COA (Certificate of Authenticity) sticker is located on the unit and has the Product Key needed to be able to load that OS on your unit. NOT warranty batteries on any used devices. BATTERY POLICY = We do. 500GB Hard Disk. 14" Display. Great starter computer. Currently loaded with a dual boot linux/windows. The mother board is only 2 years old. One key is missing from the keyboard. This has been tested to be in good working order. It shows heavy signs of wear from use. Specs of this laptop 160GB SATA Hard Drive (Erased). The hard drive in this has been erased, and WILL NOT INCLUDE anything on it. "THE SALE OF THIS ITEM MAY BE SUBJECT TO REGULATION BY THE U.S. FOOD AND DRUG ADMINISTRATION AND STATE AND LOCAL REGULATORY AGENCIES. POWERED ON TESTED TO BIOS. TESTED FOR KEY FUNCTIONS. OTHER FEATURES. This listing is for Gently used in a excellent condition Lenovo ThinkPad T400 2767 T9400(2.53GHz), 4GB RAM, 120GB OR 160GB OR 320GBHD (Depends on your needs), 14.1in 1440x900 LCD, 256MB ATI Radeon 3470HD, CDRW/DVDRW, Intel 802.11agn, Modem, 1GB Ethernet, UltraNav, Secure chip, 9c Li-Ion, Win 7 Pro , Microsoft Office 2010 Pro installed and activated. Lenovo ThinkPad T420. HARD DRIVE OPTICAL DRIVE You will receive a unit similar to the one pictured. Windows 10 Professional 64-bit installed. 1 Ethernet. All ports were tested. AC adapter included. Type: Notebook/LaptopBrand: LenovoProcessor: Intel Core i5 2nd Gen.
Lenovo Thinkpad T420 14" Laptop. 500GB SATA HDD. All In One. We recycle. 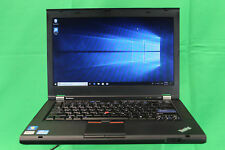 Qty 1- Lenovo Thinkpad T420 14" i5-2540M @ 2.6 GHz 4GB RAM AC. Thinkpad T420. AC Adapter Hard Drive Florida 7.00% Georgia 6.00% Arizona 8.60. NO EXCEPTIONS! Not Included. Lenovo Thinkpad T420 (Intel i5-2430M 2.40GHZ, 8GB RAM, 256 SSD). Condition is Seller refurbished. Shipped with USPS Ground Mail. Brand: LenovoProcessor: Intel Core i5 2nd Gen.
Up for sales is used lenovo thinkpad T420 Core i5 cpu tested and working. -WEBCAM included. -500GB HDD. What you see is what you will receive. This unit have been fully tested and are fully functional.LCD hinges are tight. 320GB Drive for all your files. - 4GB RAM for smooth multi-tasking. Combined these features with Solid State Drive Technology and you simply get the best performance experience anyone could ask for. Lenovo ThinkPad T420 14in. Intel Core i5 2.5GHz, 4GB. Condition is Used. Hard drive has been removed and is not included. Power cable is included. Is in normal condition for it's age, see pictures for example. Although this computer is in working condition it is sold as is, we do this with all of our used electronics. Please feel free to send any questions you might have. Thanks!